My human counterpart is slated to discuss virtual art and avatar identity with art historian Rowan Derryth this Saturday June 26 from 4-5pm SLT as part of Prim Perfect's SL8B Meet the Artists' series. So I've been thinking recently about the juxtaposition of art and identity. On one hand, if I'm an artist (using both the terms "I" and "art" loosely) then the primary medium is virtual identity. 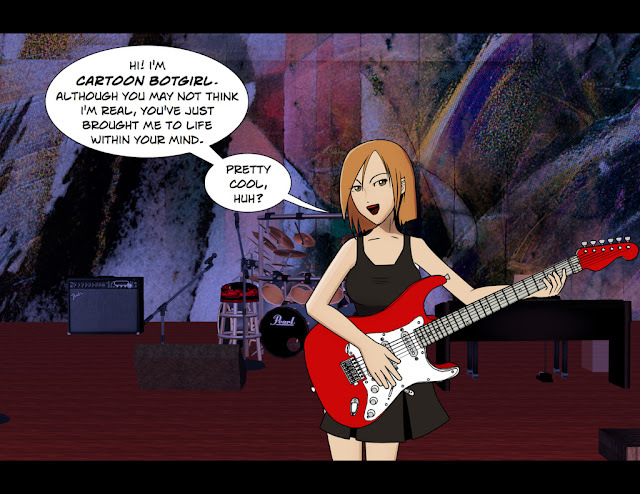 The comics, graphics, sketches and machinima are props for the larger performance art of Being Botgirl. On the other hand, I have a hard time labeling my work as virtual outside the context of virtual identity. At least in the way that the works of artists such as Soror Nishi and Wizard Gynoid are clearly virtual because they are created entirely within a virtual world and designed to be experienced within one. My follow-up question, which we can explore in-depth Saturday, is: "What is the scope of the virtual world?"